Seventy-five years ago, the dragons fell from the sky. We thought they were just meteorites - six terrifying explosions rang the world like a bell. When the dust settled, we went on with our lives as though nothing had happened. More than a decade later, five of the eggs hatched. The dragons that emerged were small and weak. They kept to the shadows, working in secret to persuade people to do their bidding, offering magic as payment and reward. Years passed...and still we didn't notice the evil growing in our midst. Aren has lived by the rules all his life. He's never questioned it; that's just the way things are. But then his father is executed for treason, and he and his best friend, Cade, are thrown into a prison mine, doomed to work until they drop. Unless they can somehow break free.... But what lies beyond the prison walls is more terrifying still. 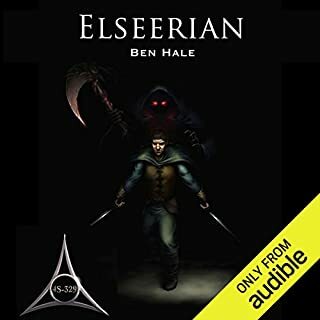 Rescued by a man who hates him yet is oath-bound to protect him, pursued by inhuman forces, Aren slowly accepts that everything he knew about his world was a lie. The House of Berethnet has ruled Inys for a thousand years. 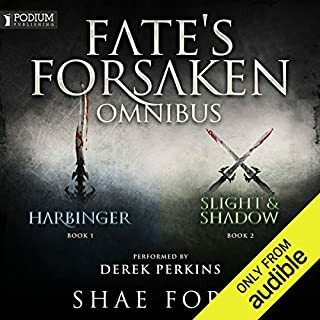 Still unwed, Queen Sabran the Ninth must conceive a daughter to protect her realm from destruction - but assassins are getting closer to her door. Ead Duryan is an outsider at court. Though she has risen to the position of lady-in-waiting, she is loyal to a hidden society of mages. Ead keeps a watchful eye on Sabran, secretly protecting her with forbidden magic. Surprising and gripping. Loved it! Aaron Jace had a normal life until they came for him. Now he's being hunted. Assassins will stop at nothing to find him. Aaron is from Earth; his family is not. He is the last scion of an ancient and powerful family. Thrust into another world, Aaron must find his way to the one man who can help him survive. 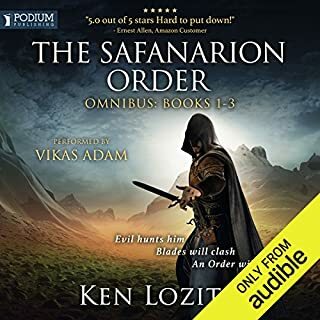 The Safanarion Order includes the first three stories in the captivating epic fantasy series listeners describe as compelling and full of suspense. The Wizard's Council of Tarador was supposed to tell young Koren Bladewell that he is a wizard. They were supposed to tell everyone that he is not a jinx, that all the bad things that happen around him are because he can't control the power inside him, power he doesn't know about. The people of his village, even his parents, are afraid of him, afraid he is cursed. That he is a dangerous, evil jinx. 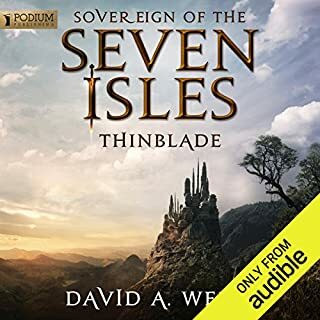 The final audiobook of the Sovereign of the Seven Isles begins in the mountains of Andalia with Alexander - wounded, surrounded and fleeing for his life. Isabel learns that Phane can use her link with the darkness for his own, terrible ends. And Abigail rallies the Coven to face the Sin’Rath, a threat now magnified a hundred fold. 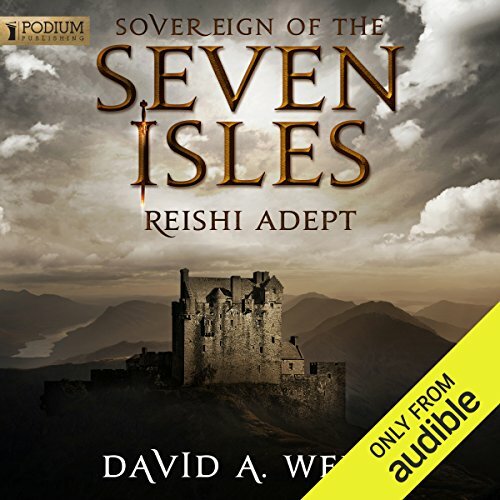 Battle rages across the Seven Isles, and Alexander Reishi stands at the center of it all. As forces converge on the Nether Gate, he departs on a desperate quest to free Isabel, kill Phane and banish the Shades for all time. 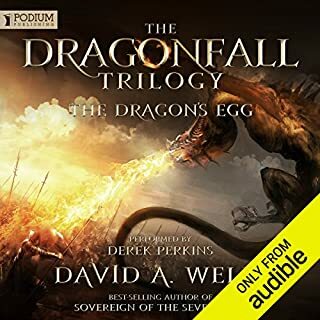 I loved this series of books Wells creates such vast and amazing world's full of adventure and fantastic fantasy, just awesome. The narrator certainly did it justice as well. 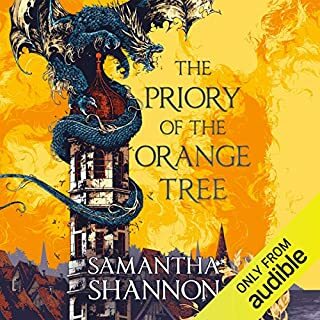 Likeable characters, epic fights of varying scale and it didn’t feel like it outstayed it’s welcome despite being 7 books. Enough new twists to the typical ‘fantasy magic system’ to keep it interesting. Had a great time listening. I would love a follow up book/series to see how the characters have gotten on. Endings to these epic series always seem a little rushed, guess you just want to hang out with the characters a little longer. Great job David! Excellent narration by Derek as well. An epic story based in a world full of wonder and beauty, overshadowed by dark threats. 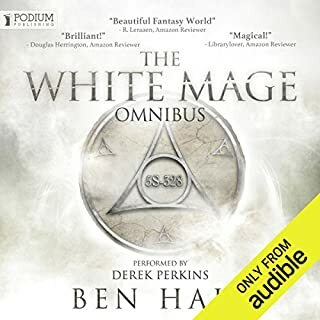 A must have for any fan of fantasy and magic. Think R.E. Feist cross Ben Hale and thats about the writing style. 5 Star performance! I love the characters and was satisfied with the ending. Struggled a bit with all the fighting and killing. An amazing story, holds you fixed for hours. Sad it's over but all great things end. I will be listening over and over. An awesome book and series. Action pact. Lots of magic and heaps of fantasy characters for the imagination. I just wish there was more in the series. 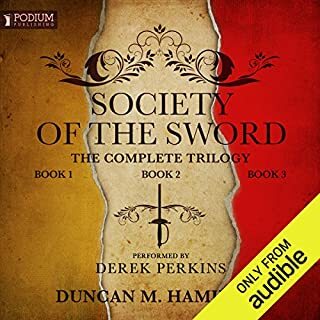 The ending missed a final word from Phane and no word from the other Sovereigns. Also his powers were never fully realised. Other than that it was great narrator was awesome no issues there. Not great, but better than many. Loads of sidetracking in this series and too little focus on the main plotline for quite a few books. This story ends here though, and thank you for finally getting there Mr. Wells. Could have been so much more done with the power of the main character. He seems to make the strangest mistakes at times, and always ends up having to go though a few more chapters before getting back on track. As the numbers of books increase, so does the number og characters to follow, most of them turning 2 dimentional after a few chapters. There are really only three deep characters in this story, and it could have been finished within a trilogy. Read in between the releases of better series, or better yet... don't waste a credit better spent elsewhere. Runs fine at 1.5x speed on my Samsung S5 without distortion. Good narrator is a plus. this has turned out to be a great series! its fast paced but still builds and keeps you wanting more. I highly recommend this series to everyone! ! So I started story a year ago I like the first three books. 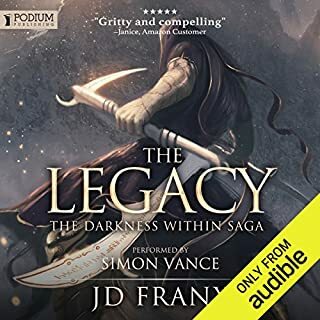 it should end at three because of the book 7-ish was just a hassle to get this last book because it was just such a long story of the same characters never having a conflict of interest and the black and white nature of all the characters. The entire series was thorough and beautiful. The Herod were not who you expect and the possibilities for the future of the Seven Isles is infinite. Overall I'd give the series a thumbs up. The characters felt a bit too straightforward at times- the good were "ultra good" and the bad were evil in the extreme (with a few exceptions). That's refreshing in some ways and a bit predictable at other times. The unadulterated nature of the hero of the story was a bit hard to relate to, he was just so darn pure of heart. 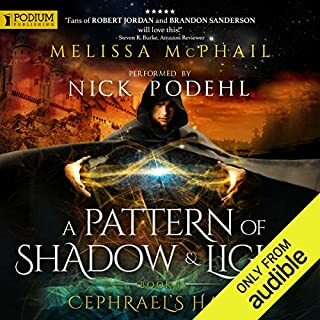 At it's core, it's a story of light vs. dark, so I guess the characters reflect that, and It's hard to slam the story too much for that, since I knew that was the case going in and it's what I wanted. The only real complaint I have (the above is really just an observation) is how quickly the storyline wrapped up at the end. The author took so long describing each and every trial the heroes overcame throughout the entire series in hyper detail, that I wanted the same level of explanation of what happened after the story arc climax. Instead we got a 15 minutes grand overview and hints and snippets. 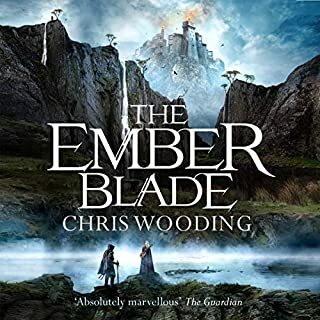 The author obviously took great delight in painstakingly crafting horrible and awful scenes for the characters to walk through and overcome, only to wrap things up way too quickly to feel really satisfied at the end, though it wasn't completely dropped. I do like the overall storyline. The use of magic in the story was well conceived and thought out, and the creativity of the realm was very immersive. The author described each scene with detail sufficient to picture exactly what was going on. I was also able to connect with the characters sufficiently (despite my above comment) to feel invested in them and care when they suffered or triumphed. The reading was very well done (as most audible authors seem to be) and the range of voices helped identify and the performance added to the story immensely. 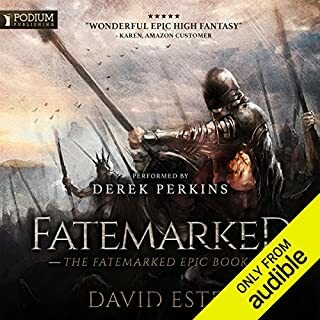 The narration was awesome, Derek Perkins give life and voice to each character with amazing ease. This book was an amazing crescendo and finale to an amazing story! The details written by David A. Wells paint an amazingly vivid picture in the mind! I especially love that it was a fight for the old law, one that I can understand and one I try to live every day. This could very well be seen as a libertarian-esk manifesto in a sense as the old law is freedom from government and freedom for all so long as the freedom of another is not violated. This was the best story I have listened to so far. I loved the ending. The story line was exciting and fast paced. Great narration!! Thanks to all that made this story possible. Overall I enjoyed the series. 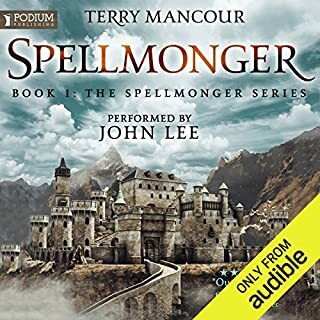 The magic system and creativity of many elements within the world kept my attention and imagination running along with the story. The characters have a very clear stance and fit into the overall scheme of good versus evil very well. I knew going in that this would probably be the case and rather enjoyed it. I really liked the concept of the main character's magic. He's a wizard...but not really and has this strange ability to see emotions/intent. There were many unique creatures and abilities that stood out from the fantasy genre. The overall light nature of the series contributes greatly to the four stars I gave it. The characters, at times, had no definition. Everything was always for the good of everyone and the light and nothing could be for selfish reasons. I honestly think four books and many headaches could have been avoided if there were just a couple of selfish acts by the main characters. Also, every action was full-throttle. There seemed to be a lot of "put everything into this one spell" or "with the last of his strength" to the point where it was very questionable if the character should even be standing, let alone carry-on like it was just a rough day at the gym. Also, the main character kept saying throughout the series, even at the end, that he needs to learn more about his powers and guess what happens...nothing. Nothing happens of significance that let's him learn about his powers and that was quite frustrating. The last book took me the better part of a year to finish because it was convoluted and boring at times. It made me laugh that the main character pretty much ignored the advice and counsel of many of the people who were more experienced in areas than he was. He would dismiss them without a second thought. The main villain had no reason to drag out events like he did. There was so much time wasted it makes it hard to believe that a villain of that caliber would make such stupid mistakes and sit on there hands. Last thought, the main character could have probably died in the second book or so and things would have worked out fine for the world. This was a brilliant series with a great ending. Each book got better and better and the final book was no exception. Fantastic. Could not wait for book 7. Well worth it though. The story just got better and better. The whole series is long so there are inevitably lulls in the story. However, It was thoroughly enjoyable as a whole and Derek Perkins performance was phenomenal. His portrayal of Phane was so good that I looked forward to his appearance in the story. What amazing finish to a fabulous set of books it's just a shame there isn't any more to add to the collection yet !!! I thoroughly enjoyed not only this book, but the whole series. 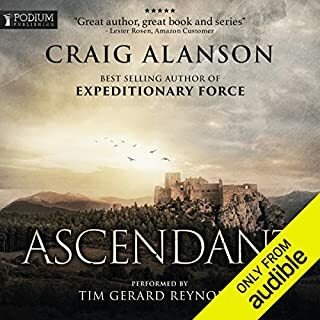 The storyline was excellent and the author kept the plot moving very well with characters that were strong and consistent. I highly recommend the whole series. I found myself very conflicted with this series of books. It almost felt that it was written by two different people. 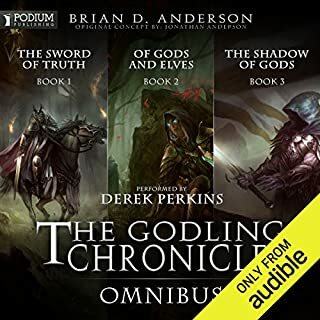 The first 3 bools where very character led focused around our central protagonist however after book 3 all that changed with jumping perspectives each chapter which in its self is no problem but for a series of books to change like that was annoying. I found that towards the end of the series it was less about developing the new characters and felt it was rushed through and these characters were added for the sake of adding them or to make it more fantastical. I was disappointed in the ending not so much for the un answered questions which in the first 3-4 books were very well explored. But the fact that it did not give the charachters their deserved time especially with jack and the rest of his immediate group did lucky ever get the hang of wizards dust, did they manage to redo the mages fast. I would recommend this set to friends but I would pre warn them. 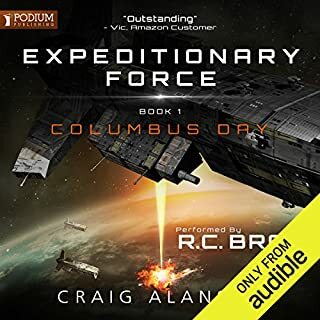 In all the central characters were well developed and the main plot was solid but I feel that it lost a bit of direction in the last two books and would of bee. Better off staying the course than adding side plots which were not developed fully or finished. I have finally been able to listen to all 7 books consecutively. Enjoyed it immensely. An epic finish to an epic story. From the first book Wells captured me. 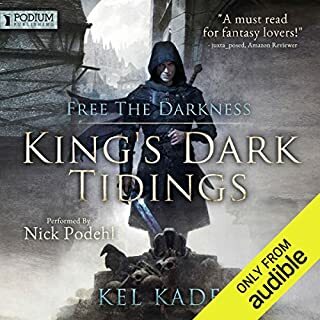 Spinning a tale of Love and hate, of light and dark, of honor and betrayal, and of life and death (with a constant tale of magic and creatures of myth) All the threads neatly tied off. I was gutted to finish and hope that a new series continuing the Reishi story will emerge!!! All in all a great series! Will definitely be listening to again. Forgot to mention a thanks to the awesome Derek Perkins who's voice and pacing brought the characters to life. 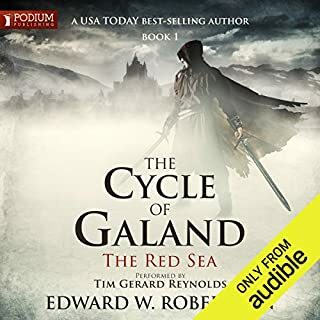 Great story great narration recommend :) could not stop listening to . five stars.